This will be the first blog post in an upcoming series about physiotherapy and common pathologies or injuries seen by physiotherapists. We will be examining in detail the causes and nature of various pathologies, who they affect, treatment options, self-management and how physiotherapy can help. The first pathology that I would like to deal with is an extremely common but frustrating and painful condition called tennis elbow that as a physiotherapist I encounter regularly in practice. 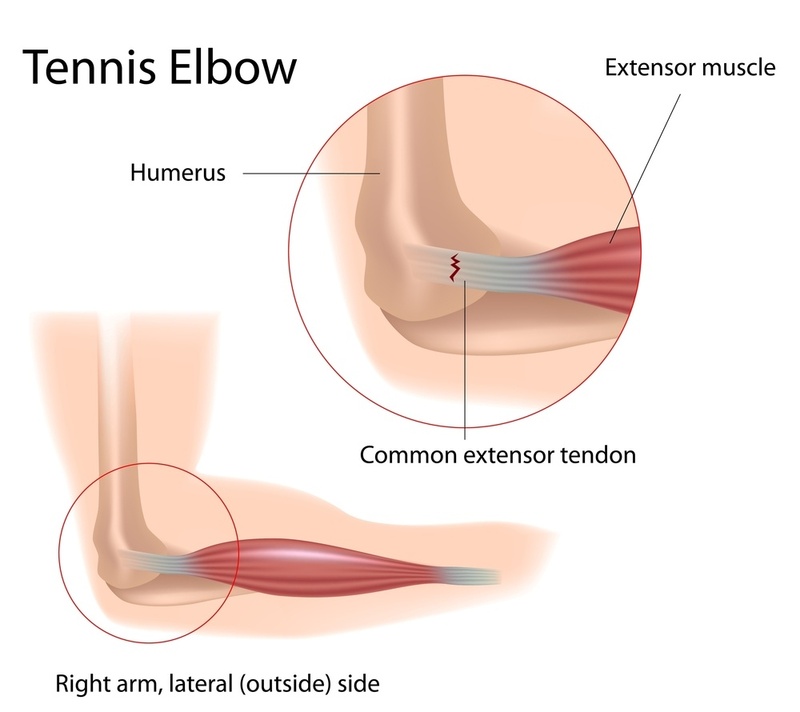 Tennis elbow has several other more complicated sounding names such as lateral epicondylitis, lateral epicondylosis and lateral epicondylalgia. All of which basically try to describe the fact that the pain people feel is at the outside (lateral) bony bit of the elbow (epicondyle). The pain normally comes on when picking up heavy objects, twisting items such as screwdrivers and can be quite sharp and uncomfortable. It is one of the most common musculo-skeletal conditions that a physiotherapist will see and affects approximately 3 – 11/1000 patients per annum (Dingenmanse et al 2012). It is thought to occur in 1.4% of the population (Shiri et al 2006), now these do not sound like huge numbers but when you consider the size of the UK population (roughly 60 million) then 1.4% of the whole population is a lot of people! It is 7 – 9 times more common than the next most common elbow injury: golfer’s elbow (medial epicondylitis) (Walz et al 2010) and causes prolonged time off work especially in chronic sufferers (Walker-Bone et al 2012). Numerous studies have shown that it is associated with handling tools and repetitive twisting and lifting actions of the forearm (Van Rijn et al 2009) basically meaning that if you are an electrician, carpenter, manual labourer or a housewife then you are at an increased risk of developing the condition. So… what causes it? Well that is a common question for physiotherapists and seemingly a simple question. Unfortunately it is a complicated answer and will need us to look in some detail at both the anatomy of the elbow and physiology of tendons. Which will be covered in the next blog post.